Here is some general health info that Westies in Need has gathered over the many years of knowing and loving this wonderful breed. If you have any question that you would like to know the answer to and you don't see it below, please let us know and we can add it to our list! Please note that this information is not meant to be a substitute for holistic, traditional or emergency veterinary care for your Westie. We have been asked by many folks to make a step by step document of our Westies in Need itchy skin protocol. Here it is…it is LONG and there is lots of info…please read it carefully and let us know if you have any questions. Westies in Need has had some incredible improvements…we know Westie skin! Q). My Westie has itchy skin, smells like a corn chip, has recurring ear infections, is licking or chewing on her feet...what do I do??? 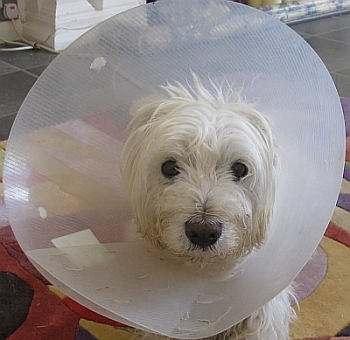 You are probably reading this because you are at your wits end with your itchy Westie. You have been to a number of Vets with little if any improvements and it has been expensive and frustrating...watching your darling Westie suffer is a terrible thing. We have been asked by many folks to make a step by step document of our Westies in Need itchy skin protocol-so here goes...it is LONG and there is lots of info...but please read it carefully and let us know if you have any questions...Westies in Need has had some incredible improvements...we know Westie skin! Q). My Westies' tummy is sometimes growly-really loud sometimes and seems to be sore...sometimes she won't even eat, other than grass to throw up...what should I do??? Does your Westie's tummy make a lot of noise at times? Sounds like an angry alien is inside trying to get out? Do they refuse to eat when this happens? make sure that your Westie is on a good Digestive Enzyme. This is something that should be given daily and forever. A good digestive enzyme can drastically improve your dog's digestion and absorption of nutrients. The one we have used is from a company called Mercola. The company is from the US and in the past we Canadian folks have had to get it shipped north--however a Canadian pet store has now brought in many of the Mercola products and will ship anywhere in Canada...YEA. The store is The Healthy Dog Store and they even offer our Westies in Need folks a discount. Our rescue has also had great success with a product called Seacure. It is a fish based protein supplement that you just sprinkle onto your Westie's food morning and night and it has helped so many dogs with that sore and grumbly tummy. (They sell a powder and a treat-we have only used the powder) The product was originally developed for humans and added to the diets of malnourished or starving children in third world countries. It is sure worth a try...works really well!!!! they will need to get something in their stomach as soon as you can but some refuse to eat. To give your Westie some immediate relief (this does hurt!) you can offer them any of the products below. As soon as you see they are feeling a bit better-please offer them a small meal or treat. Pepto Bismol: (we still like the Pepcid better)- comes in a liquid and you can give 0.5-1 ml per pound--please note NOT the Pepto Bismol Ultra Strength-just the regular strength. Q). My Westies throws up a yellow foamy bile quite often, what should I do??? Throwing up Bile: Although not serious, throwing up that yellow foamy stuff is nothing that pet parents like to see. What your Westie is throwing up is bile. Bile serves important functions in the digestion of food and removal of waste materials from the body. Bile is created in the liver and stored in the gallbladder until food has been ingested. Vomiting bile is usually seen in the morning and is often caused by stomach inactivity which aggravates the bile reflux. Make sure you always give your Westie something to eat before bed to keep the tummy full for as long as possible. Our rescue has also had great success with a product called Seacure. It is a fish based protein supplement that you just sprinkle onto your Westie's food morning and night and it has helped so many dogs that throw up bile. (They sell a powder and a treat-we have only used the powder) It is sure worth a try...works really well!!!! If it continues and does seem to become an issue, you can speak to your Vet about giving them Ursodiol. Ursodeoxycholic acid (this is a prescription medication) can help to improve the flow of bile through the tiny ducts into the gall bladder and then from the gall bladder into the intestine and prevents a build up of bile. Q). My Westie gets ear infections...what can I do???????? Ear Infections: The ear cleaning solution we really like and use all the time is the "Blue Power" treatment. It has been around for a long time and works great!!! Not expensive either and good for yeast! Mix all ingredients together in the alcohol bottle and shake it up. Remember to shake the bottle well each time before you use it so the boric acid powder will be evenly distributed. ,br/> Use a squirt bottle to apply the treatment to the ears, which you can buy at most drug stores. You could also use a hair dye bottle which you can purchase at beauty supply stores. Put cotton balls or similar absorbent material under the ear. Flood the ear with solution, (gently squirt bottle), massage gently to the count of 60, wipe with a tissue. Flood again, wipe with a tissue, and leave alone without massage. Q). I am confused about vaccinations for my Westie..should I vaccinate and when??? When and should I vaccinate my Westie??? There is a lot of controversy right now over vaccinations (in both people and pets) and the fallout of over vaccinating your Westie can be devastating. If you choose to vaccinate your Westie the most important thing we suggest is to NEVER vaccinate your Westie for anything in the spring, summer or fall months. Their immune systems are at their most vulnerable at those times and skin problems are much more likely to occur. If you choose to vaccinate (and yes it is a choice!!!! )only vaccinate your dog if there is snow on the ground!!! Also, never vaccinate for rabies and DHPP at the same time-it is very hard on Westies and again not good for their immune system. It is very important to wait at least 2 weeks between rabies and DHPP-they should NEVER be given at the same appointment. When you think of vaccinations…always remember that old saying "the cure can sometimes be much worse than the disease"
Titer-Testing-an alternative to vaccinations: A number of our Westie folks have opted for a titers test each year and not deferring to the automatic vaccination protocol. A titer test (pronounced TIGHT-er) is a laboratory test measuring the existence and level of antibodies to disease in blood. Most experts believe that strong titers are a more reliable indication of immunity than vaccinations: tests show the actual immune response… not just the attempt to cause an immune response by vaccination. Q). I am confused about kennel cough...what is it and should I vaccinate for it? Kennel cough, also called Bordetella, is a common canine upper respiratory infection that is triggered by the presence of both the parainfluenza virus and the bacteria called Bordetella bronchiseptica. Kennel cough is contagious and can be spread in the air by the sneezes and coughs of infected dogs. Many boarding facilities, kennels, doggie daycares, groomers, and even some veterinarians require that dogs be vaccinated for kennel cough. Please understand the only reason these people demand your Westie be vaccinated is to remove liability from themselves. They're just bouncing liability away from their businesses by requiring your dog be vaccinated for kennel cough. The fact is Bordetella vaccines are, for the most part, useless. They won't prevent your Westie or any dog from acquiring kennel cough. Kennel cough is most often a complex cocktail of different infections and not just a single infection. Because it's caused by a variety of different bacterial and viral agents, there's no one single vaccine that can provide protection for all those different infectious agents. If you do choose to give the Bordetella vaccine ask your Vet to use the intranasal vaccine, which is a nose drop. It is significantly less toxic than the injectable vaccines. The important thing to remember is that your Westie can still get kennel cough even if he or she has been recently vaccinated. We recommend that you avoid this unnecessary and frequently ineffective vaccine if at all possible and focus on keeping your pet's immune system strong and vibrant, which is really the very best defense against kennel cough. Q). My Vet has suggested allergy testing...is it useful??? Allergen immunotherapy rehabilitates the dog's immune system. The therapy involves administering increasing doses of allergens to accustom the Westie to substances that are generally harmless (pollen, house dust mites) and thereby induces specific long-term tolerance. OK…so what does all that mean??? Simply put, your dog will receive the very things (in small doses) of exactly what she is allergic to and her immune system will learn how to tolerate them. Blood Serum Test: A 10 ml blood sample is drawn by your regular Vet from your Westie and sent into the lab. The blood is screened for a reaction to a broad range of allergens including pollens, dust, and molds that are common to the geographical area where you live. 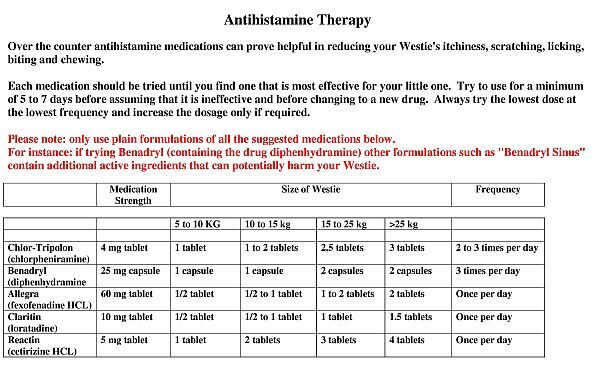 If your Westie is currently on medication like steroids or an antihistamine, you do NOT need to stop the medication for the blood serum test. Intradermal Skin testing: In this test, your Westie will be sedated and have a large patch of fur shaved. A small amount of 50 different antigens are injected into the skin and after a short period of time, the area around the injection site is observed to determine if your Westie is allergic to the allergen. Now this is an important part-so please know… If your Westie reacts to lets say cat dander and it's a big reaction, then the lab would for sure put this in and is taking up space (only 10-12 allergens can be put in the allergy shots) BUT…if that Westie has no exposure to cats then it doesn't need to be in. When your regular Vet (or even better, your Canine Dermatologist!!!) formulates the allergy results please know what they are including…again, if your dog is allergic to cats but has no exposure to them not much sense to add it!!!! You will then receive, from the lab, a series of vials that will contain the exact allergens that your Westie has tested positive for in higher concentrations. If you are reading this and you are in Canada or the US...there is now sublingual immunotherapy (under the tongue) allergy drops. In the past you would have had to give your little one allergy shots, but YEA!!! no longer. Just a drop under the tongue and they are good to go. Next, a program will be laid out for you and you will use the different concentrations of the serum as the months go along-higher concentrations means less often, so that is a good thing! The first stage is the "induction" phase and then comes the "maintenance" phase. Induction Phase - 3 months long. Your Westie will require an allergy shot to begin every other day, then down to once a week and then down to once every 2 weeks. Maintenance Phase - Your Westie will require an allergy shot once every 3 weeks and then once a month and then once every 2 months. There may be seasonal components involved as well…perhaps in the winter months they will not require an injection at all and then in the spring and fall it may need to be increased. Your Westie may need these allergy shots for only a few months or perhaps for the rest of his life…but if he is happy and comfortable and not itchy… it is well worth it. We have found that more than 75% of Westie have very positive results to this therapy. Q). My Westie has a bit of diarrhea today...any suggestions? All dogs, at one point or another, have had a bout of diarrhea. Most diarrhea lasts a couple of days, however when loose bowels continue over a long period of time it can be a cause for concern; especially if the diarrhea gets severe and is uncontrolled liquid squirts. A dog can dehydrate FAST from severe diarrhea. If it is mild, please give them some canned pumpkin mixed in with their meal for a few days. (Please note: not pumpkin pie mix (you know the one with all the spices)--just pure pumpkin). Pumpkins are very rich in fiber and adding two heaping teaspoons of canned pumpkin in your Westie’s food will help the digestion process. Canned pumpkin has a large quantity of dietary fiber and it will absorb the excess water present in the stool. This makes your dog’s stool more firm. Q). My Westie has been eating the same food for a while now and for some reason she does not seem to like it any longer...why is that? If your dog has been happily eating it's dinner every night and now for some reason turns his nose up, it may be that the kibble has gone stale. Dog food has a expiration date on it-which of course needs to be monitored, however long before that date has come and gone it is very possible that the food has become stale, the nutrients have leached out of it and any fat content may become rancid-even though it's still crunchy- it just does NOT taste good any longer. Try an experiment...put a slice of bread in with the kibble and leave it over night, as you normally would (either in a sealed container, in the bag zip-locked or just open in the pantry-whatever you usually do) You will find, in the morning, the bread will be hard and stale-not very appetizing-same thing for kibble! So, here is our tip...as soon as you purchase a bag of food, take out the amount that your Westie will eat over the next 5-7 days and separate the rest of the bag into freezer sealed zip lock bags and pop them in your freezer. That will keep the older kibble fresh. As soon as you open the fresh, new bag (of exactly the same food) you will see that she really perks up. Q). My friend told me to give my Westie a medication or a "home remedy" that I am not sure of...what should I do? What is safe and not safe to give your dog??? Can you give your Westie milk???? What about human ear drops??? Can you put Visine in a dog's eye??? Can you give a dog a human laxative??? 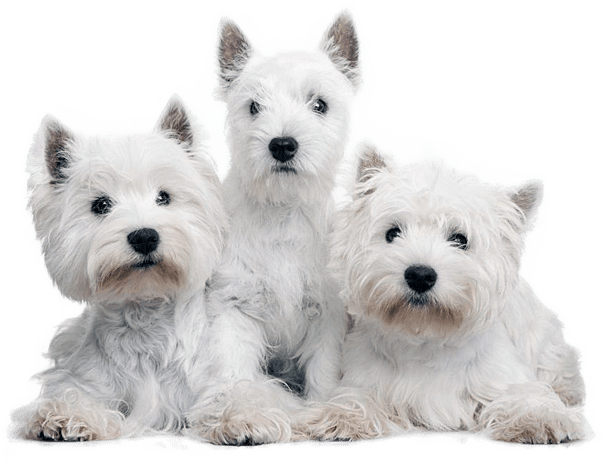 These are questions we have been asked at Westies in Need and because we can not and don't know the answers to all questions, we often refer folks to a website called "Can I give my dog...?". It has a lot of great info with some helpful suggestions of what is safe and what is NOT for your dog. Q). Does my Westie really need nutritional supplements? If so, what should they have? Are Nutritional Supplements Really Necessary? In one word...YES. The primary categories of pet supplements include those for joint health, skin and coat health, GI tract health, and liver and kidney health. Because our breed is predisposed to skin problems, we do suggest supplements to help with both the outside and the inside of the Westie. Digestive Enzyme - very important if your Westie has any tummy concerns like a growly stomach etc. Complete probiotic - this is especially important if your Westie is ever given anti-biotics. It is very important to make sure you add a probiotic while they are on the any antibiotic and for 2 weeks afterwards. Krill Oil - is an omega-3 supplement and is naturally loaded with antioxidant power. Spirugreen- is a powerful combination of nutrients to support the immune system-a great multi vitamin. We don't want to push or suggest any one company, but we have found the products from Mercola to be a great source for our supplements. Q). I would like to have some suggestions on what shampoo to use on my Westie...and what not to use! If your Westie is not suffering from any itchy skin then you can use any high quality shampoo--please stay away from any shampoo with Oatmeal-great for some dogs but oatmeal based anything is not suggested for dogs that are predisposed to skin problems! If possible (and again this is for dogs who do NOT have itchy skin) bathe your Westie no more than 4 or 6 times per year-keep those wonderful natural oils where they are! However if you are looking for helpful hints because you have an itchy Westie... it is VERY important to bathe your dog…you must get the bacteria and yeast spores off the skin. We would suggest a bath every other day until the yeasty smell starts to dissipate and then every 3rd or 4th day till you see that the skin is looking less "angry". If the problem is over most of the body you may want to shave them down, you'll waste less shampoo and they will dry faster. Use cool water and towel dry only, do not use a hair dryer. After the 10-15 minutes, rinse off all the shampoo and make sure there is no shampoo residue. While still in the tub, finish off with an Apple Cider Vinegar (ACV) solution on them. Please Note: YOU DO NOT RINSE THIS OFF!!! Natural organic apple cider vinegar has a brownish tinge to it and floating stuff inside. The floating matter is called "mother" and is formed from the pectin and apple residue. You can purchase it at most health food store. Put about ¼ of a cup of ACV in a plastic measuring cup and fill the cup with warm water. After the bath, pour the rinse (from the neck on down-do NOT get this in your Westie's eyes) and then towel dry---don't rinse it off. It is a great and natural way to improve the PH balance on their skin. Q). What should I feed my Westie? And what should I NOT feed them? We have found that most of our Westies do best on a fish based diet. What you are looking for is a grain free, low glysemic diet…low glysemic (or low sugar producing) because sugars feed yeast and that is what you want to avoid. It is also important not to feed foods that are high on the "allergen meter" for Westies…so everyone repeat after me…when choosing food and treats…"no wheat, no corn, no soy, no beef, no lamb, no dairy"...repeat please so we know you have it…"no wheat, no corn, no soy, no beef, no lamb, no dairy"
...you may be shocked at the ratings of these "prescription" foods! We would also be remiss if we did not mention... that under no circumstances, for any reason, feed TREATS FROM CHINA, such as dehydrated Chicken, Duck and Sweet Potato- we have already lost one lovely Westie boy because his family unknowingly was feeding him tainted treats. Q). I have heard that Pure Tea Tree Oil is dangerous for dogs...is that true? I had no idea about the dangers of using Pure Tea Tree Oil on pets until I tried about 5 drops of it on my dog for a minor sore one evening. She seemed OK when I initially put it on, and she went to sleep as normal. In the morning (a lovely sunny, warm spring morning), she didn't want to get up. Even the promise of a trip to the park, which would usually send her hurtling towards the door did not entice her. I did not immediately think too much of it, as we had had a very long and eventful week and I thought perhaps she was just over-tired. But, when we got to the car, she seemed to be having trouble getting in. Then, when she just sat, and turned her nose up at her favourite treats, I knew something was very wrong. Her usual vet was not yet open, so I took her to the emergency clinic. We were seen quickly, and I described her symptoms - she wouldn't eat; was listless; had trouble moving her back end. As the tea tree oil was the only new thing I had introduced, I mentioned that to the vet as well. That's when I got the devastating news that tea tree oil is toxic to dogs and cats. I was shattered. I have always been extremely careful with anything that I give my pets and as she had had other commercial products made for dogs that had tea tree in them (namely ear cleaners), it never occurred to me to investigate it further before using it. The affects can include the following: Low body temperature, Weakness, Walking drunk, Inability to walk,Tremors, Coma, Increased liver enzymes or death. The vet said that because it was applied topically and not ingested, she might stand a better chance. But, there is no antidote, so there were only a few things they could to to try to mitigate its effects and then hope for the best that her system was strong enough to process it and move it through. They took her into the back and scrubbed her with dish detergent to remove any residue of the oil, and shaved the area that I had put the oil on. They hooked her up to an IV to hydrate her and try to keep her system moving the toxin through and hopefully out. I was able to go and sit with her once this was done. It was the most heartbreaking sight I have ever seen. She had continued to deteriorate and now could not lift her back end. And every time she inhaled, all her muscles would tense and she would tremble. My beautiful, perfectly healthy dog had come to this in 12 hours from 5 drops of oil. She lay on top of my arm in the hospital crate and slept. Within a few hours, I noticed some positive changes. The first was that she ate the food that they offered her - all of it! And when she finished, she moved off my arm, and settled down to sleep again. Her trembling began to subside. She went outside to urinate and was having better control over her back end. She slept more. Her trembling stopped. She ate more. She stood and walked solidly on her own. She ate again! She was given another full work-up and her vitals were all normal. I came back in when they were finished her work-up and she was standing on her hind legs wagging her tale and chattering away to me!! After 12 gruelling hours, I was able to take her home. She trotted down the street to the car and hopped up into the front seat (her seat) like nothing had happened. I was drained but unbelievably grateful that we had escaped the worst. But we were not totally out of the woods yet. A side affect from tea tree toxicity can be liver damage. She was on liver boosting supplements for several days, and then re-tested at her regular vet later that week. She was given a clean bill of health and I truly exhaled for the first time in 6 days. Within a few weeks, her sore had healed, her fur had grown back and you would never have known that I nearly lost her. Q). My Westie seems to have some mild seasonal allergies...sneezing, itching, watery eyes...what can I give him? There are many effective and safe over-the-counter medications (that do not require a prescription) that can be used for dogs with seasonal allergies. Please note: only use plain formulations of all the suggested medications below. For instance: if trying Benadryl (containing the drug diphenhydramine) other formulations such as "Benadryl Sinus" contain additional active ingredients that can potentially harm your Westie. Q). My Westie seems to have some muscle weakness, she seems a bit depressed, is not that interested in her food and has been vomiting a bit---we have a Vet appointment booked, but any idea what it may be ? What is Addison's Disease.... 70 to 85 percent of dogs with Addison's disease are female and between the ages of four and seven. Some breeds seem more at risk for the disease than others, including Westies...our rescue has had a few Addisonian dogs. There are three types of Addison's disease - primary, secondary and atypical. A common cause of both the primary and atypical forms of the disease is immune-mediated damage to the adrenal glands. This is a situation in which the dog's immune system attacks the adrenal tissue. Secondary Addison's is caused by failure of the pituitary gland. Addison's symptoms can be quite vague and include weakness, depression, loss of appetite, vomiting, diarrhea, and sometimes increased thirst and urination. Addison's is often referred to as the great imitator because it is often misdiagnosed as kidney failure or a case of the dog just not feeling quite right. In a case of suspected Addison's disease, your vet will look for clinical signs like dehydration, a weak or slow pulse rate, irregular heartbeat, generalized weakness and depression. The confirming test for Addison's disease is an ACTH stimulation test. In this test, blood samples are taken before and after the dog is injected with an adrenal-stimulating hormone. Treatment of Addison's disease depends on whether the condition is primary, secondary or atypical. Holistic veterinarians have an arsenal of herbs, homeopathics, nutraceuticals and other great natural substances that can help improve the quality of life of Addison's dogs. Q). My Westie seems to have this on going cough and a bit of a rattling sound...what could it be? Please bring your Westie to a Vet right away-it MAY be Idiopathic Pulmonary Fibrosis. Idiopathic pulmonary fibrosis, also commonly called "Westie lung disease", literally means scarring of the lungs. The lung scarring occurs in the tissue of the lungs which supports the structure of the lungs. Pulmonary fibrosis causes the lung tissue to scar and lose its elasticity and become stiff so that oxygen is prevented from entering the blood stream. Compared to other breeds, Westies seem predisposed to the disease as do the Norwich and Cairn to a lesser extent. Westies are affected differently and at varying rates. A Westie can suffer from this condition a long time before any symptoms appear. The diagnosis of pulmonary fibrosis is usually made around 10 years of age and is more common in females than males. At first, the Westie may seem to loose its stamina and tire easily. A dry cough is often present so that the disease is often misdiagnosed for bronchitis and is characterized by crackling sounds heard on breathing. We have known some Westie with pulmonary fibrosis and although it is never a diagnosis that any owner wants to hear, Westies can live a long and full life. We have found that using a medication called Theophylline (bronchodilator) has helped many a Westie with Westie Lung disease. Q). How do I know if my Westie is diabetic? The signs of early diabetes are frequent urination, drinking lots of water, a large appetite, and unexplained loss of weight. If you have any suspicions of diabetes take a fresh urine sample to your vet (they can usually tell from a dip test for glucose if this is positive they will request a blood test) or set up an appointment with your vet to have your dog examined and a blood test done. Q). My Westie has been diagnosed with dry eye...what should I do? If your Vet has diagnosed your Westie with dry eye (the veterinary term for dry eye is keratoconjunctivitis sicca or KCS ) there are some medications that we have used and have found very helpful. Westies with dry eye will need to be on treatment for the rest of their lives. 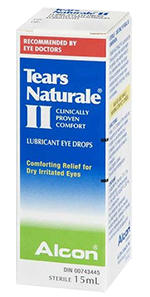 Cyclosporine and Tacrolimus are two drugs most commonly used to stimulate tear production. Cyclosporine has been the standard drug for years, although from our experience, topical Tacrolimus has been more effective. Another medication some of our folks have used with good success is Tobradex. This is the brand name for a combination of an antibiotic (tobramyacin) and a steroid (dexamethasone) The tobramycin kills any bacteria invading a dog's eye, but the dog's natural immune responses may mistake the tobramycin as an invader and destroy it before it can kill the bacteria, therefore, the steroid is added to suppress the dog's immune system so the tobramycin can kill the bacteria. Q). My Westie has been diagnosed with Addisons Disease...what does this mean and what should I do? If your Vet has diagnosed your Westie with Addison's Disease..there is hope...please click on this link to find a wonderful website, dedicated to dogs with Addisons. The mission of Canine Addison’s Resources & Education (CARE) is to provide resources and education to improve the lives of dogs with Addison’s Disease and empower owners to advocate on their behalf.